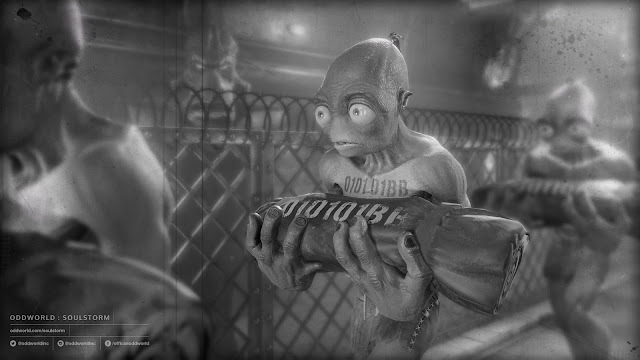 One thing I remember when doing reviews and news for my old writing place was getting to see how loved Abe and Oddworld actually was, so the fact I've not seen the Internet go crazy for this news just yet (or I might have missed that day) has been a massive surprise. I played the last game in both old and new form (well tried to I think you would call it) with my love for the Abe fart button being a memory in gaming that will stick with me until I'm in the afterlife somewhere. So the chance to press that fart button once again is surely a reason to keep an eye out for this. Oddworld Inhabitants Inc revealed that the follow-up to Oddworld: New ‘n’ Tasty will be released in 2017 and it shall be called.........Oddworld: Soulstorm (name of the post kind of gave it away already). No platforms have been confirmed just yet, but Sony seeming to be more the company most interested in it by being the only ones I've seen retweeting the above image out when it was revealed late last week on the Oddworld Inc Twitter account. The press release gave some decent facts on when the game takes place and what you can expect, so rather than me typing that up here is what it said. "Oddworld: Soulstorm picks up from Abe’s genesis and directly follows on from the overthrow of RuptureFarms and the liberation of his blighted workmates. Having defeated Molluck The Glukkon, his former boss and RuptureFarms’ meanest inhabitant, Abe soon finds himself - along with 300 newly emancipated Mudokons - without food, water or a place to call home. Stranded alone in the desert, they find solace in a strange new brew - a delicious drink that has insidious ramifications for their newfound freedom". Go follow the Oddworld Inc Twitter account to be kept up to date with this game, but I will also do my best to keep you updated when platforms and price and such things are announced.